Over the last several years, our precious guru Khentrul Rinpoche has traveled to over 24 countries around the world to spread the profound Kalachakra tantra. Despite occasional challenges to his health, he has worked tirelessly for our benefit bestowing teachings, transmissions and empowerments upon us of the most rare Kalachakra tantra. In gratitude, to support his long life and continued ability to benefit as many beings as possible, we would like to come together to perform the long life lama chöpa (guru puja). At the culmination of Khentrul Rinpoche’s North American tour on September 22, the offering will be made by students in California on behalf of all of Rinpoche’s students around the world. It will be streamed live on facebook so that everyone can join in and participate. This is the first time Khentrul Rinpoche’s students outside of Tibet have made this offering. May our sangha be successful in this great aspiration. In order to support Rinpoche’s long life we will focus our accumulation on the Long Life Diety Namgyalma. In order to do this, take refuge, generate bodhicitta and then recite the short or long mantra of Namgyalma and dedicate to Khentrul Rinpoche’s long life. You can also add in the Supplication Prayer to Khentrul Rinpoche on page 311 of the Profound Path of Vajra Yoga. Enter your mantras into the website by September 20th so they can be offered to Rinpoche at the ceremony. This creates a direct karmic link between you and the offering ceremony. As part of the guru puja, it is traditional for the sangha to make offerings to the guru both real and visualized. 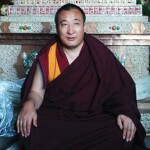 In order to overcome the limitations of narrow and biased ways of thinking, Rinpoche believes that education is the key. In order to bring about Shambhala and the golden age of Dharma, Rinpoche has an aspiration to change aspects of modern education on a fundamental level in accordance with Kalachakra. We have created Dzokden Foundation for Khentrul Rinpoche to fulfill his great aspiration. In order to make this long life offering as auspicious as possible we request the community to help us seed the foundation. Your offering will be made to Rinpoche during the long life offering ceremony. 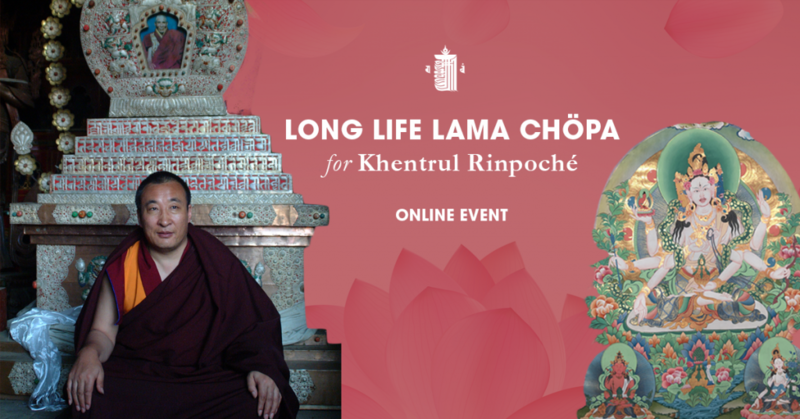 Join us on Khentrul Rinpoche’s facebook page to participate in the live stream offering. The text will be available in English for you to recite. The traditional Jonang Lama Chöpa (guru puja) has been extended to include the turning back of the 5 dakinis, kalachakra tsok and Long Life Prayers for Rinpoche. The text will be available closer to the event in English under practice materials. For each mala of 108 that you complete, count 100 mantras. There are 8 extra beads in a mala to accommodate for our human error in practicing. For multiplying days, the number of malas you count remains the same as the number you practiced. The multiplying increases the potency in the mind but does not change the overall number accumulated.